World Day for Laboratory Animals, Wednesday 24th April, is a focal point globally for the campaign against animal experiments and a time for reflection and change. Please join us – and our friends at the National Anti-Vivisection Society UK who founded World Day for Laboratory Animals in 1979 – in remembering those who cannot speak for themselves and encourage friends and family to do the same. Reflect: At midday on World Day, please observe a minute’s silence to commemorate the millions of animals that suffer and die at the hands of vivisectors around the world each and every year. Be a force for change: Help fund humane research, including projects looking at cancer and neuroscience. Please support good science which saves animals and make a donation to our sister organization, the Lord Dowding Fund, if you can. 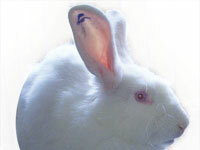 Support non-animal research: donate today!